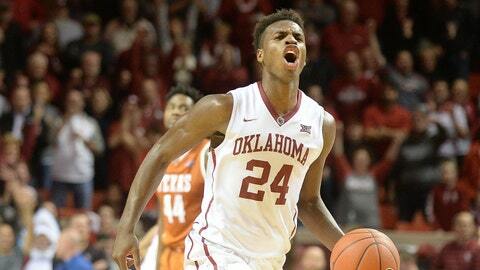 Oklahoma senior guard Buddy Hield is a strong favorite for the Naismith Trophy this season. On Thursday morning, the candidates on the Naismith Trophy midseason watch list were announced. Of the 35 candidates, 16 of them were seniors (that doesn’t include Providence point guard Kris Dunn, who is a redshirt junior). The last two winners — Creighton’s Doug McDermott and Wisconsin’s Frank Kaminsky — were both seniors. Oklahoma guard Buddy Hield is well on his way to becoming the third senior in a row to claim the player of the year honors. The 6-foot-4 shooting guard is second in the nation in scoring at 25.7 points per game, while better than 51 percent from the field, 50 percent from three and 90 percent from the line. He’s also had a series of clutch plays, and posted arguably the best individual performance of the season: a 46-point game in a triple overtime loss to No. 1 Kansas on Jan. 4. This list will be trimmed to 10 before the start of the NCAA Tournament. Four finalists will be revealed on March 20. The winner of the 2016 Naismith Trophy will be announced on April 3, the day before the national championship game. MORE NEWS: Want stories delivered to you? Sign up for our College Basketball newsletters.